I think that there is a household to which it comes by installing such an all-night light in the bedroom at nighttime, too. It is not likely to be able to become quite deep sleep by dazzling this quantities of light though I also install in the ceiling and the wall and it is asleep. A black vinyl tape is wrapped around this shining part, and this all-night light is concealed in the place in which it doesn't see it, and it is what where it doesn't go smart easily though risked. TThen, it remodeled it as shown in the photograph. Power consumption becomes small, too and two birds a Koku. 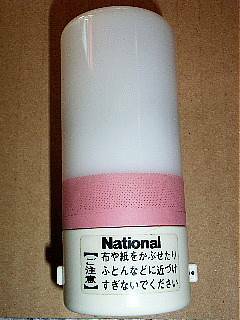 This is remodeling of the all-night light named LB06086T of National. First of all, the part from the part to the socket that sticks in the outlet under the left is separated. And, the one that the silicon diode for the power supply rectification of about 500V0.5A and the resistance of 390Ω 1/2W were made a series here is put in the circuit and it puts it in the series. The entering remodeling ends ..space.. well only by this. A plastic part of the switch operation is detached in the photograph as seen easily though there is a point of contact of the switch in lower right. This resistance is reduced when it is too dark in 390Ω or it is [shinishitemi] ..it is... When it is too bright, resistance is enlarged. It became faint brightness and it came to be able to sleep very a lot. The all-night light of fluorescent lighting fixtures can be similarly remodeled. In this case, I think that you should put the film capacitor of about 200V1μF in the series instead of the diode and resistance. 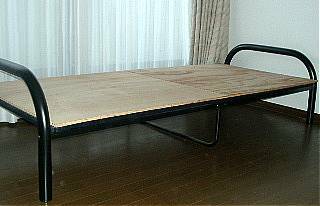 There is uneasiness in strength of the top board a little though a pipe bed on the market may be cheap. 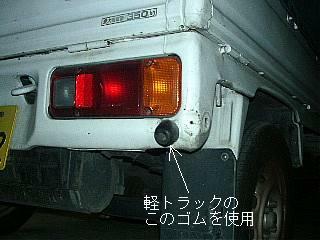 Moreover, the gride sound might be heard while using it. I solved these faults cheaply and easily. The sound is not done while using it, and strength is quite different though weight increases considerably up to now. The Yamaha Motor Co., Ltd. passing wagon of the electric Miwa assistance bicycle is steady and it is very convenient for the elderly person. However, be not to be able for the person who can take a ride on a bicycle to return when the swing detent tool is put up and to be dangerous and good to get on. The bicycle falls when the [kato] remark is put into the swinging state and the dangerous one in the elderly person. Then, I made it to remodeling this for father. Rubber made an application when the back of the carrier of the light truck was knocked down was used and remodeled. 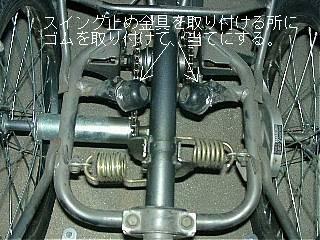 The bicycle is prevented from swinging so much right and left by installing application rubber of the carrier of the light truck in the place where the swing detent tool is installed as shown in the photograph. To enter a moderate state of the swing actually getting on, the size of rubber is decided. I used rubber that had taken side with the redcap of Mazda. I think that I can similarly remodel electric tricycle [rirakuru] of National. The bed has been remodeled for the treatment of low back pain. It doesn't recover easily, and I think lumbago be a lot of a person embarrassed due to lumbago. I have treated lumbago many times by pulling the waist with the device of making by oneself. This is an introduction of the device that treats lumbago that remodels the bed. I was recently lumbago, and was relieved. When it is the third continuous, it has gotten lumbago at last in the country in several years ago however work to pile up the stone wall. It hung in the orthopedics department because you may not pass about two months. It was just said that it was not, and a reechy place was a thing of recovering if it left it though taken an X-ray by it. What the orthopedist had already said by the translation that hung in the doctor because it did not recover even if it left it was made a thing not trusted. Apparently, hernia of the intervertebral disk. confirm my symptom with the book on medicineThe method of treatment recorded in the book is written that pulling is good. Because my mother had been seen to be pulling her foot due to degenerative hip disease, the draw gear was made referring to it. It seems to improve if 30 minutes are pulled in the place where there is lumbago before it sleeps and before it occurs. Obstinate lumbago is continued for about as much as one week and has recovered completely. I cured lumbago in every case with this device though it frequently became lumbago after heavy luggage was carried. Two pulleys are installed in foot side of the bed as shown in the photograph. 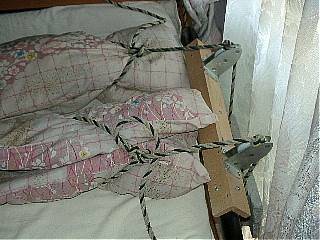 So as not to shut even if the square cushion is rolled in the foot and it pulls it on with the rope, it binds. I made it to the bowline. The rope is prevented from moving more than to some degree putting the choke end on the entrance of the pulley. The weight is hung through the pulley. I installed the concrete block of 8kg by both feet. The foot is put in the square cushion by the sense that puts on shoes. The foot doesn't just come off about the ankle even if it is loose when the rope is made to hang a little up. If the every part of the body is moved in the direction of the head of the bed, the waist is pulled well with the foot. It doesn't have the chest or any head.